Practice: Malasana / Garland Pose + a mini anatomy lesson! The traditional malasana is practiced with the arms wrapped around the body, with the hands clasping at the back. This both requires and gives a big opening to the shoulders and chest, as well as opening the hips and lengthening the Achilles heel (a place in which many runners can experience the symptoms of tendonitis). The more commonly used posture in classes is Upavesasana – which is often mistaken for malasana because of the similarity in appearance. 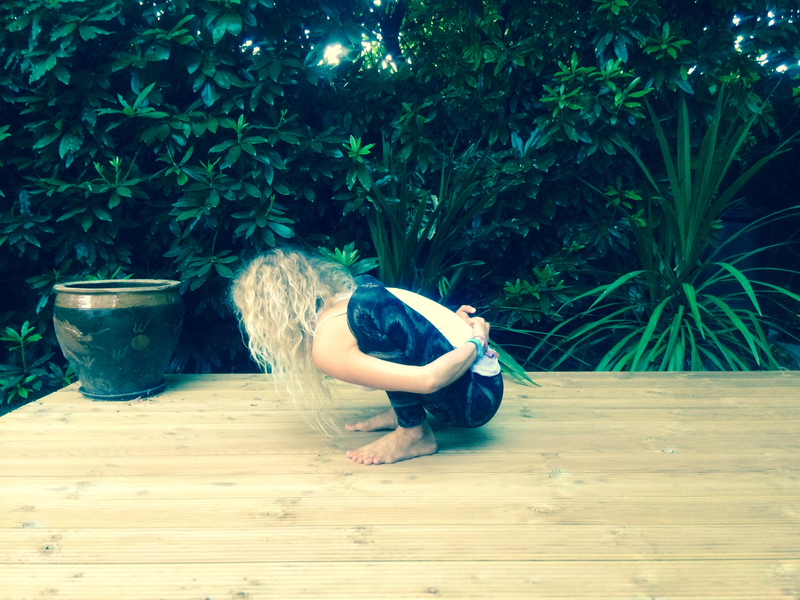 Upavesasana is essentially squatting; something other cultures do a lot when they’re cooking, playing, gardening…. and going to the toilet…. FYI – this is also how we used to use the bathroom, but when the Victorians invented the conventional toilet as we know it today and we began to use that instead, this is when things changed, and consequently our bodies became less able to get rid of waste because of the unnatural positioning of the body. But I’ll leave that subject for another blog post…. possibly after I return from India this Winter…. Squatting in this way is such a natural position for the human body to be in – you’ll probably notice that children easily and comfortably put themelves in this position a lot of the time when they’re playing. It’s only when we grow older and we find ourselves sitting, driving, and generally doing a lot less ‘playing’ that squatting in this way becomes uncomfortable, and almost painful if your body is particularly less mobile. Upavesasana is a little more accessible than Malasana, but both are beneficial to practice in their own way. 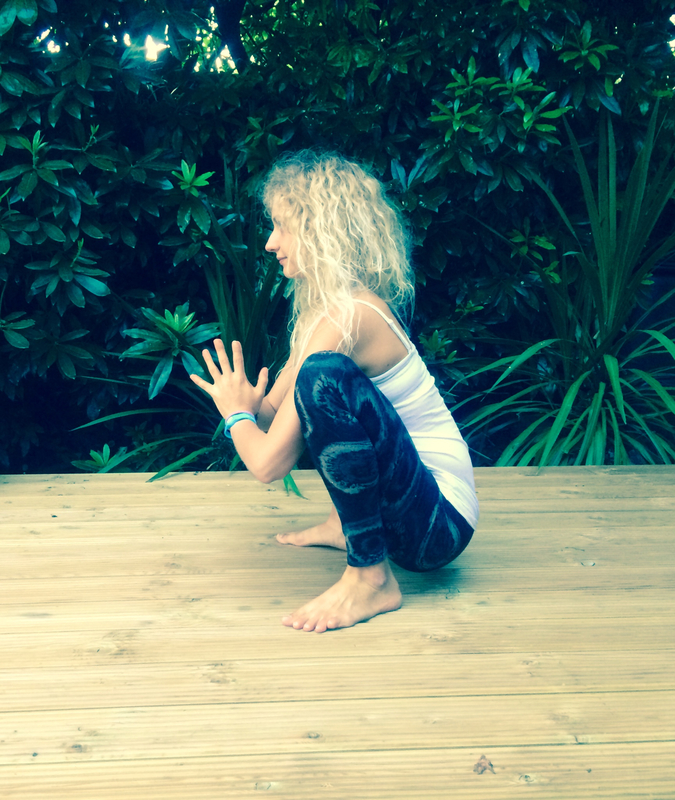 Consistent practice of this asana helps the hips to become more flexible – and if there’s one part of the body it’s useful to have more flexibility in it’s the hips – not so you can then put your foot behind your head, but because tightness in the hips is often one of the causes of knee pain! This posture also helps us observe the difference between tension and compression, and also the vast difference between each of our unique bodies. Tension is muscular ‘tightness’, and we can work with this in many ways. The more you practice, the more likely you are to release tension within the muscles – especially if you’re mindful of letting go of the places in which we habitually hold tension due to emotional stress. After a few years of practice (or if you’re already naturally very flexible) you may begin to run in to compression. This is when our actual bones are colliding, preventing us from ‘going further’ in a posture. When we face compression, this is when we literally cannot go any further in a posture, no matter how much lengthening and opening we continue to do. The only thing that happens when we try to force the bones, is serious injury, which is why it’s important to recognise the difference between tension and compression – especially in those who are more flexible and are actually more at risk of more serious injury. 1. Everyone has a completely different bone structure, and the differences between us all are actually quite staggering. This is why one alignment instruction will not work for everyone. 2. 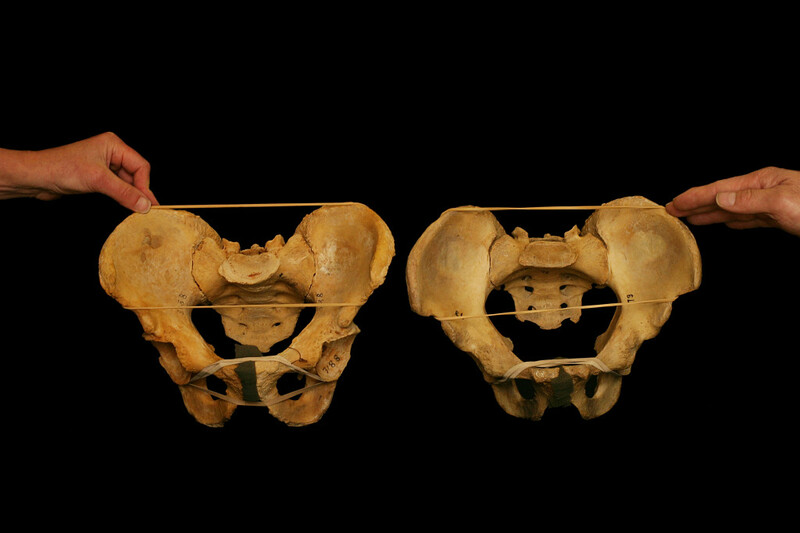 Everyone’s pelvis is a slightly different shape (see above). 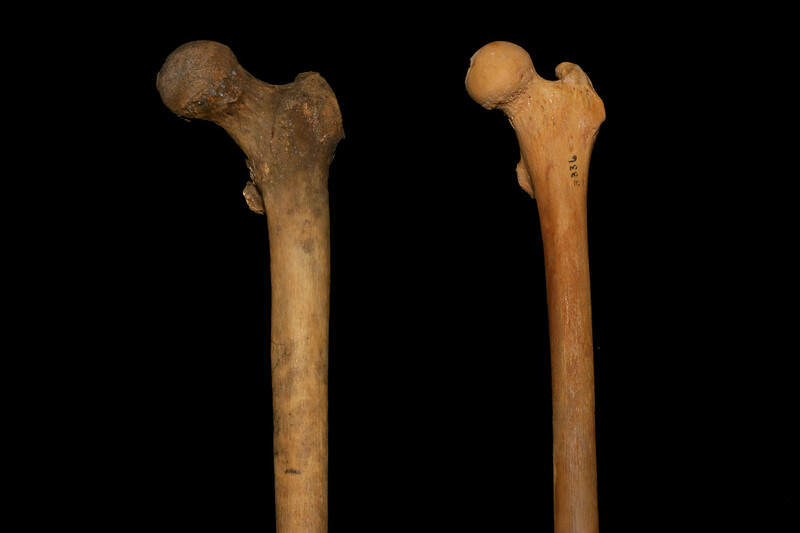 The ball and socket joint of the hip is made up of the femoral head – the rounded end of the femur or thigh bone, and the acetabulum, the socket in the pelvis, into which the femoral head fits. Take a look at the photos below. 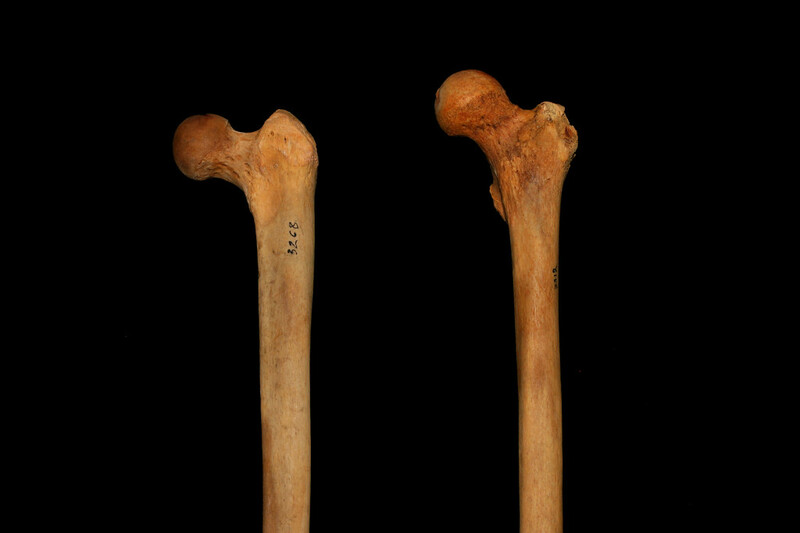 These are two femur bones, each with the femoral head positioned completely differently. 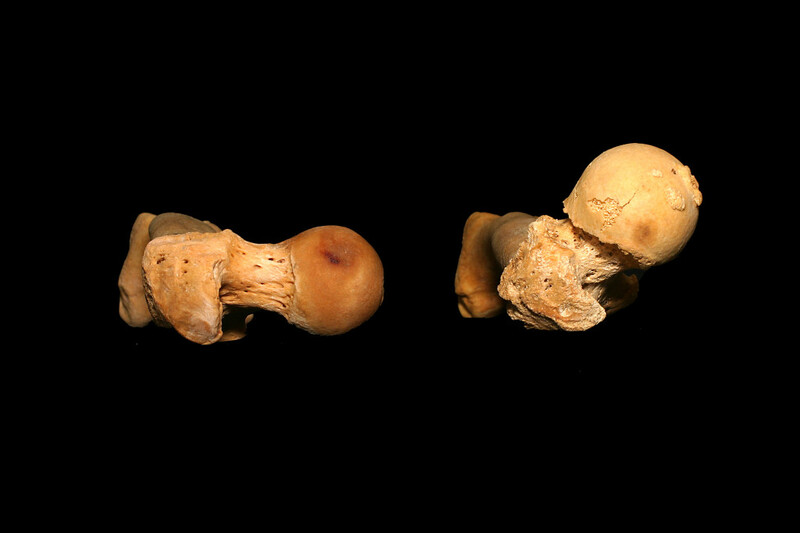 Some point more downward than others, some femoral heads are smaller than others, and some are at a completely different angle. Obviously, this is going to have an effect on how each person squats, and means everyone will have a different experience with squatting. 3. Things get even more interesting when you take a look at the acetabulum. (The socket). 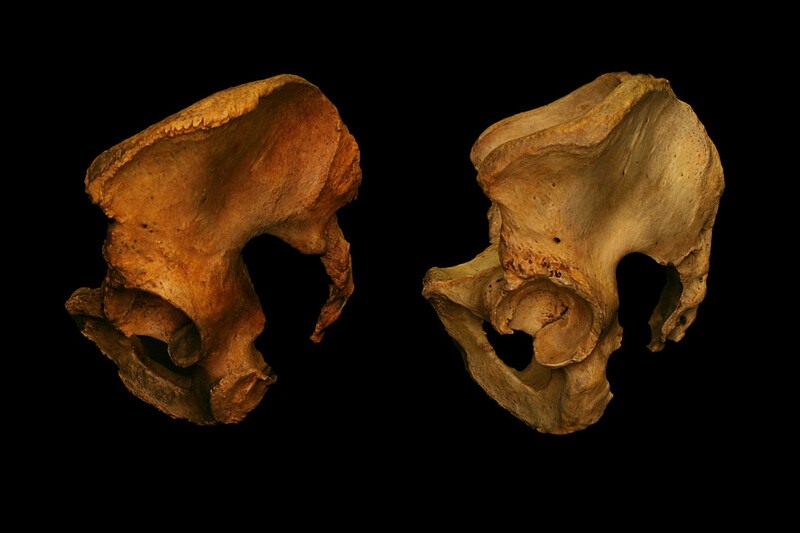 In the photos below, the pelvis on the left shows the acetabulum are pointing more forwards than on the right hand side. This indicates the person may have a more narrow stance when squatting, and the pelvis on the right allows for a wider squat. 4. When it comes to getting the heels to the earth, this could well be a case of tight Achilles tendons, or it could be compression at the front of the ankle joint. We’ve seen how different everyone’s skeletal anatomy is; so after a few years of practice, there may not be any more you can do to bring those heels any closer to the floor. This is a brilliant lesson in santosha – the Sanskrit word for one of the Niyamas – Contentment. When we accept ourselves fully, just as we are, we can begin to practice in a way that will benefit our own unique bodies. Instead of trying to fit ourselves in to an idealistic version of the shape of a posture, we can find a way to allow the posture to work for us, allowing our practice to be about experimenting and discovering, instead of performing and forcing. To prepare the body for upavesasana or malasana, begin by moving through your surya namaskar A and B, as it will be easier to open the hips, thighs and ankles when the legs are warmer. When you next return to downward facing dog, take a sequence of virabhadrasana 1, virabhadrasana 2, and prasarita padottanasana to further open the hips and warm the legs. After your prasarita padottanasana, move to Goddess pose to open the adductors – the inner thighs and groin muscles – and then return to downward facing dog before repeating the other side. After, lower the knees to the floor and roll on to your back for a moment. Take ananda balasana (happy baby pose) to further open the thighs and groin muscles. After spending a few breaths here, hug the knees into the chest and rock along the length of the spine and on to all fours, before extending back into your downward facing dog. From your downward facing dog, bring the hands towards each other, to the center line of the mat. Begin to walk the feet towards the hands, and take the feet a little wider than hip width apart. Lower the hips down, and bring the torso to fit snugly between the thighs. If the heels don’t make it to the floor, either remain where you are – remembering that if you’ve been practicing for a while, then it is likely that this is because of how your skeleton is built, and not because of ‘tight’ muscles (although time will tell if you’re new to the practice), or bring a block or a rolled towel or blanket underneath the heels, allowing them to rest on the prop. 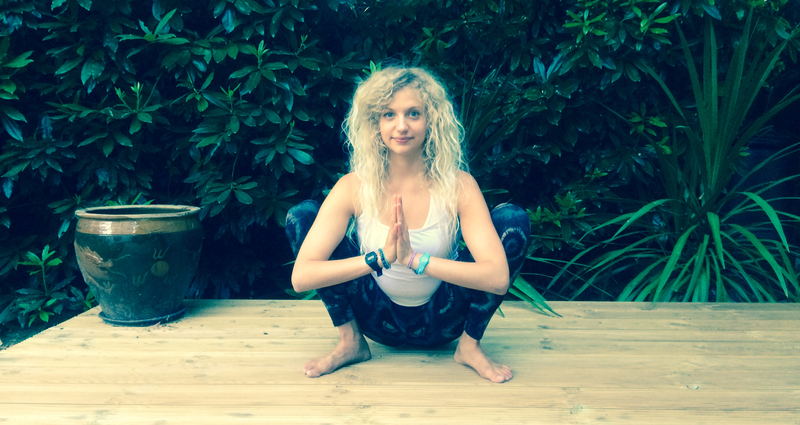 From here, bring the palms together in Anjali Mudra, and simultaneously press the legs in to the upper arms, and the arms in to the inner legs – this will help to keep engagement of the upper body, and lengthen the spine. Keeping the spine lengthened and the back of the neck long is important here to keep the sense of opening, even in this relatively compact posture. Maintain an openness of the shoulders and chest. Maintain the engagement of Mula Bandha (the Root Lock). Shiva Rea cites malasana as one of the best postures to feel the lift of Mula bandha in. Click here to read more on that theme. To go further in to malasana and to find a deeper opening in the hips and thighs, continue to press the legs into the arms as you reach the arms forwards. Internally rotate the arms, so that the palms face behind you. Stay in malasana or upavesasana for as long as is comfortable – this is such a beneficial position for the body that you can stay here for a while! Bring your awareness to the breath, allowing deep inhalations and exhalations to calm the mind and bring a sense of ease to the body. The smoother and deeper the breath, the more positively the body will respond to being in this position, as we’re switching on the parasympathetic nervous system (the rest and digest system) when we breathe consciously in this way, helping the body to heal and return to a healthy, wholesome state. To transition out of the posture – bring the hands to the floor in front of you, about shoulder width apart, and press the feet into the earth as you lift the hips to come into uttanasana. From there, slowly roll up to stand in tadasana (mountain pose), and take a moment to observe the effects of the asana. To take your pratikriyasana (the counterpose ) for upavesasana or malasana – should you want to – take Gomukhasana to open the outer hips, and paschimottanasana to re-integrate the femurs and lengthen the hamstrings and calf muscles. Upavesasana and malasana can easily be practiced daily. See how many actions throughout the day you could incorporate this posture into! This is a great article. Very informative and well written. Thanks for sharing.